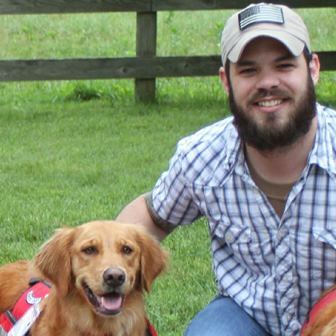 Current Status: Hero Dogs Graduate, partnered with Veteran Jonathan G.
My life has changed in the last month or two. I moved out of the kennel and am now living with Petra and her family as I continue my training. I was feeling a little stressed out at “college” with all the big boys. You know, they want to play and wrestle all the time! A sensitive girl like me needs her peace and quiet sometimes! I am very happy now living in a more restful home. Don’t get me wrong, there is always something for me to do here at their house. Petra keeps me busy with daily training, outings, and exercise. The best thing about living here is that I get to swim in the pool almost every day, or at least until the weather gets too cold. Petra keeps telling me that I need to wait for permission to jump in… and I really try but sometimes I can’t help myself. I just love to swim around in circles and splash in the water. We recently invited all the Hero Dogs to come for a puppy pool party. That was a blast. All the dogs came to play in the backyard and to swim in the pool. There were a couple of dogs that were nervous about jumping into the water but I showed them how it was done. I was quite the hostess. Petra tells me that I am a very helpful pup. Whenever I hear something hit the ground I am there to pick it up. It doesn’t matter what it is… a piece of paper, a spoon, a coin, a pen… I am there to return it to its rightful owner. I have a special fondness for socks and often show up with one in my mouth that I have found somewhere in the house. I don’t chew on it. I just think that it shouldn’t be on the floor! I return the Kongs to Petra after dinner so that she can wash them and I put away my toys at the end of the day. Petra and I have been working on commands that a veteran with PTSD might need to use. I am always very happy to rest my chin on a lap to offer comfort or to just get a soft pat on the head. We keep trying to perfect the things that I already know like walking nicely behind a shopping cart (hard to see back there) and walking without pulling (but there is always so much good stuff to sniff) and pulling open a door and picking up my leash. I’m a little nervous around loud noises or different looking things. We went to the party store the other day and Petra showed me around all these creepy looking characters that sounded very odd. I was pretty nervous at first but we kept going back and I finally got used to it. It’s a warm day so I think I’ll check with Petra to see if we can go for a swim. Click here to read Rosie’s full blog.